Secret: When a friendly minion dies, summon a random minion with the same Cost. Effigy and Spellbender have to be some of my favorite secrets in the game. Spellbender is so flexible and they never expect it. 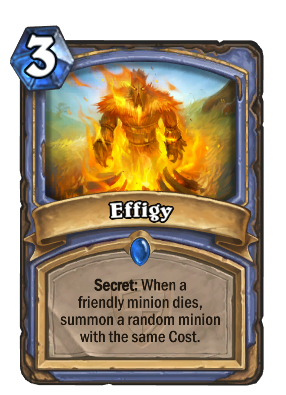 They check for counterspell with something that doesnt affect the board to then get screwed, really good against paladins and priests :D Effigy is also never expected and if you have a big card out lets say 8 cost you get insane value, especially if they are forced to kill it. So am I dumb...or do I not understand how this works? My opponent plays mad scientist, apprentice then mirror images...next turn he unstables gets a bomb lobber. Trades apprentice dies, mad scientist and lobber 1 health. I holy nova...mad scientist dies brings out effigy, effigy triggers on lobber????? Shouldn't it have triggered on the mirror images since they were played first? Maybe he played the Mad Scientist after playing Mirror Image? Then Mirror Images die ->Scientist dies ->Effigy comes in play->Bomb Lobber dies->Effigy triggers on Bomb Lobber. Starting to love this card after two recent games. 1: Archmage Antonidas + Effigy, Antonidas dies, Effigy summons... Antonidas! 2: Rhonin and Force-Tank MAX up, the tank dies, Effigy summons... another Rhonin! Then next turn I play Malygos, opponent can't kill it, I sacrifice a Rhonin and fire off 32 Arcane Missiles, killing off everything his side including the hero. Oh man what a feeling. Wrong. Eye for an Eye and Competitive Spirit can be triggered on your turn. recent unstable portaled into a sneeds, effigy, he kills sneed and I get a kel'thuzad into sneed back plus free legendary. This and unstable portal are amazing! Liking this better than mirror entity. Your opponent can play around Mirror Entity but not this, whereas mirror entity is so infamous that everyone ever plays around it. Mad Scientist dies => Effingy is put on the battlefield. Does Effigy also trigger with the Mad Scientist's death? Got this card in foil form today, so happy! It makes golden minions, first minion burned and resurrected? Azure Drake into Sludge Belcher, this card is amazing! It makes golden minions anyway. Playing against Dragon Priest. He puts down Chillmaw. I put down Dr. Boom with Effigy up. (yes, I know bad move since the Boom Bots could trigger it, but is there ever a bad time to Boom)? Yes there is ever a bad time for Boom. For example, when you have effigy or your opponent has mirror entity. Also terrific when steering the opponent into killing good deathrattle summoning minions like Piloted Shredder, Harvest Golem or even Piloted Sky Golem.